Formula 1 bosses have announced an unchanged calendar for 2012, despite continuing doubts over the races in the United States and Bahrain. The revived US race, due to take place on a new track in Austin, Texas, had been given a deadline of this week to raise money to pay the sanctioning fee. 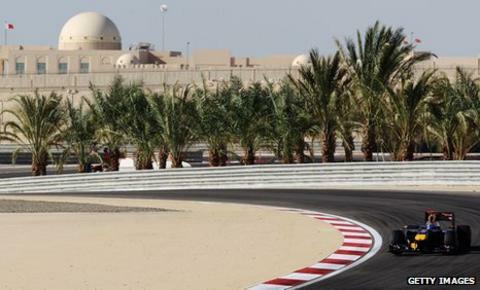 Meanwhile, there are concerns about the wisdom of racing in Bahrain next April because of continuing civil unrest. A bomb exploded outside the British embassy there only on Sunday. Despite that, the race was included on an unchanged 20-race calendar issued by a meeting of the World Council of governing body the FIA in Delhi on Wednesday. Bahrain's Grand Prix was cancelled in 2011 after months of controversy following civil unrest in February in which more than 40 people were killed. The country's response to the violence was heavily criticised last month in an independent report, which accused the Gulf kingdom of "excessive force", torture and wrongful arrest. Although the king of Bahrain has since promised reforms to prevent abuses by security forces, unrest has continued there. Despite retaining its place on the calendar, insiders predict that the race, scheduled for 22 April, is unlikely to happen in 2012. If unrest continues, it is considered likely that, at some point in the new year, the Bahrainis will issue a statement calling off the race, saying they do not want to put F1 at risk by bringing the sport into a volatile environment. F1 commercial boss Bernie Ecclestone has always insisted it would go ahead - as he did last year until the Bahrainis called it off. If Bahrain is cancelled, there has been speculation that the Turkish Grand Prix outside Istanbul, which has lost its place on the calendar this year, will be revived. The Texas race, which is due to take place as the penultimate grand prix of the season on 18 November, has also been in doubt after Ecclestone ripped up the contract of its initial promoter. Ecclestone has been trying to do a new deal with the new promoter - but at a reported price of $35m (£22.4m) per year rather than the $25m (£16m) at which the race was initially awarded the deal, and which was initially expected to be paid by the State of Texas, which last month said no monies would be paid out before the race. The Austin race organisers confirmed in a statement on Wednesday that they had paid Ecclestone his fee. "Mr. Ecclestone received his cheque today for the USGP," said Red McCombs, a founding partner of the Circuit of the Americas. "We want to thank the fans supporting us, the local officials and businesses that have encouraged us, the state of Texas, Circuit of The Americas' staff and Bernie himself." Fellow founding partner Bobby Epstein said: "Our investors have believed all along that this project has tremendous benefit for our region, and provides a strong economic engine for the future." A spokeswoman for the track was unable to confirm to BBC Sport what the fee for the race was, or where the money was coming from now the state of Texas was not paying it up front. There have also been doubts about South Korea, whose organisers are trying to negotiate a reduced fee with Ecclestone - but it, too, is on the calendar. Ecclestone told BBC Sport at the Brazilian Grand Prix two weeks ago: "We're having a look at that with the promoter because it isn't working for them. We'll try and find the reason it isn't and try to help them." If Bahrain/Turkey, Texas and South Korea do take place, the 2012 season will be the longest in F1 history, with 20 races. It starts in Australia on 18 March and finishes in Brazil on 25 November. The British Grand Prix is on 8 July. The BBC will broadcast coverage from all the races, with 10 of them live and the rest extended highlights. The live BBC races will be China, Spain, Monaco, Europe (Valencia), Britain, Belgium, Singapore, South Korea, Abu Dhabi and Brazil. A reduction in the maximum race time, in the event of a grand prix being suspended after the start, to four hours from eight. The maximum racing time is still two hours.